In early September, a woman named Natalie, who survived Hurricane Irma by hiding in her bathroom on the British Virgin Islands, for 15 hours, sent a desperate plea for help on Facebook. Her island community needed clean water, food, solar generators, duct tape, and fuel, among other critical items. “THINGS NOT TO SEND TO THE BVI!!! PLEASE SHARE! We don’t need more rubbish, there are clothes everywhere, we need to stop these shipments of crap.... It will be a travesty if the VI ends up burdened with rubbish which it already struggles to deal with." 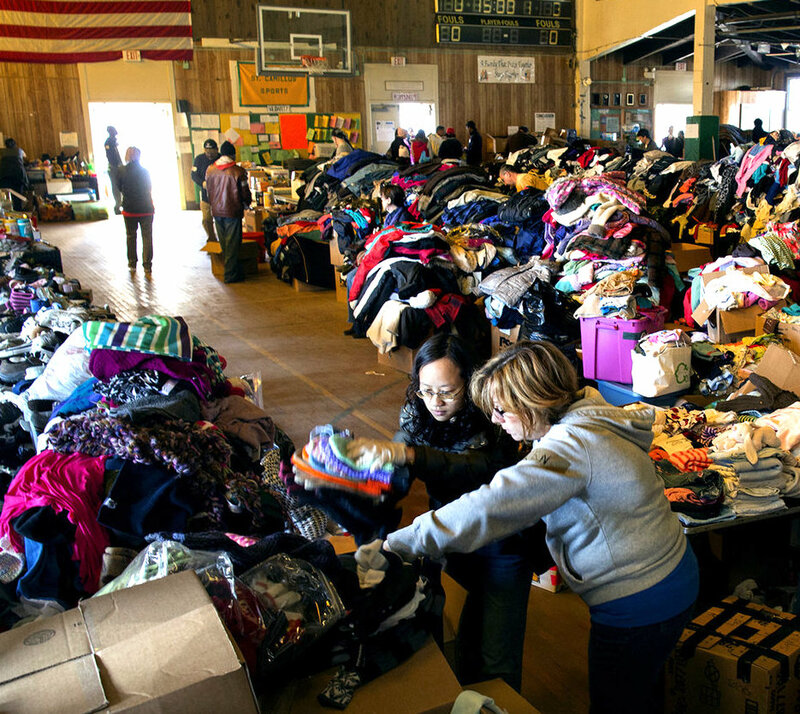 Natalie’s plea echoes what disaster relief groups call the “second disaster”: the crush of useless, often incomprehensible contributions to relief efforts, which leads to incredible waste and can interfere with critical efforts to connect people with the support they really need. Most disaster relief organizations encourage cash donations instead—there is a critical need for this—but many people are hesitant to donate money blindly in light of reports revealing how the Red Cross bungled its response to the 2010 earthquake in Haiti. Or they want to provide more personal support. So where does that leave those of us with “loving intentions” and a huge desire to help, beyond giving money (or a box of frisbees)? How can we identify the “practical stuff” that would improve the situation for folks on the ground who must now rebuild their lives? And how can we help friends and family in ways that go beyond “stuff”—with tasks like providing meals, babysitting kids and pets, clearing out debris, and rebuilding homes? At New Dream, we've come up with at least one way to help. 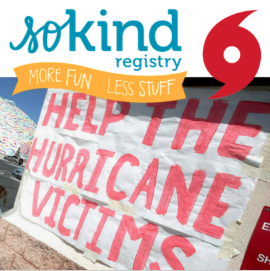 Our SoKind Registry can be used as a free, centralized tool for people to coordinate meaningful hurricane relief, either for themselves or for friends and family. SoKind is a fully customizable registry/wishlist service where individuals or groups can create lists of items they are in need of—not just material items, but also donations of time, money, labor, household help, you name it. Check out our sample Hurricane Relief Wishlist to see how to use SoKind as a completely customizable tool for requesting everything from help with tree removal and house cleaning to donations of baby supplies or home-cooked meals. Because SoKind serves primarily as a vehicle to help people coordinate and connect, all monetary transactions occur independent of the site. If you were affected by the recent hurricanes and can reliably get online, we urge you to create your own wishlist so that people can get you the items and help that you need. Or, if you have family or friends in affected areas who need assistance but can't create their own wishlist, please consider coordinating one for them. Ask them what they most need, then take a few minutes to create a wishlist, and share it with everyone you know! It’s as easy as that. Once you’ve created your wishlist, you can also share it with us at New Dream to multiply your impact. With your consent, we would be happy to use our platform to then share your registry with the wider New Dream community, as many people have expressed a desire to help out on a more personal level. If you create a SoKind Hurricane Relief Wishlist and would like us to share it with the New Dream community, please send an email with a link to your registry to newdream@newdream.org. SoKind was launched in 2013 as an "alternative" gift registry and wishlist service aimed at transforming the culture of gift giving around weddings, baby showers, and other milestone events. Rather than focusing on new purchases, SoKind encourages the giving of homemade gifts, charitable donations, secondhand goods, experiences, time, day-of-event help, and more. More recently, the registry site has evolved into a broader tool for building relationships and strengthening communities. SoKind registrants have found creative ways to use the site to deliver the most-needed contributions—both material and non-material—to those who could use a helping hand. We’ve seen SoKind used to help refugee families by providing them with the material items they most need as well as donations of time and skill. We’ve seen caregivers coordinate with their friends and family to get homemade meals, rides to doctor appointments, and dog walking help. We’ve seen homeless shelters request the exact type and quantity of toiletries that they most need for their residents. And the ideas keep coming. Here’s to more help… and less waste!